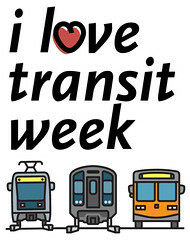 This week we decided to have a little fun and joined our friends from Vancouver’s Buzzer Blog in celebrating I Love Transit Week. 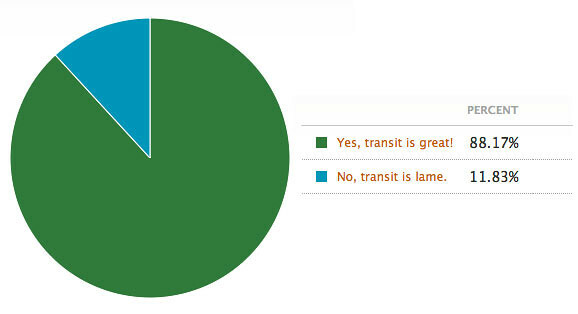 We posted a few informal polls to engage Source readers and find out what you guys think about transit and – since it’s Metro Rail’s birthday week – to find out what Metro Rail lines you love the most, and which upcoming lines you’re most excited about. While the polls are still open, here are the results so far. And to everyone who participated, thanks! Metro is inconsistent, the drivers are rude and sometimes they dont even know where they stop! The fares keep on going up and up with nothing to show for it. On the other hand, we did receive a lot of positive feedback on Twitter – check out what people had to say in this week’s Twitter Tuesday roundup. What’s your favorite Metro Rail line? 200 readers voted for their favorite Metro Rail line, and the Red Line subway has proven itself to be the most popular line with readers with 48.5% of the votes. The Red Line also happens to have the highest ridership numbers of all the lines of the Metro Rail system. The Blue Line is also heavily ridden, but it’s not really loved by readers – only 7.5% named the 20 year old line as their favorite. 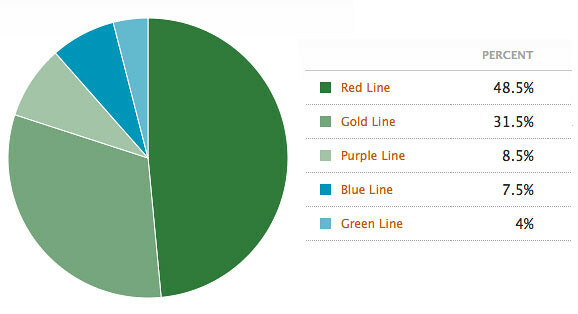 The Gold Line actually performed rather admirably in the poll, garnering 31.5% of the votes, more than the Purple Line, Blue Line and Green Line combined. Red line! I hope to work in downtown soon since the Red Line from Nnorth Hollywood to Union Station is just perfect. The walk from the station to City Hall is quick and a great way to stay healthy. I like the Gold Line the best because there is a station about a block from where I live. They are all good to me though. I have lived in a few cities and L.A. has the best public transit to me. Thanks for the great service Metro! 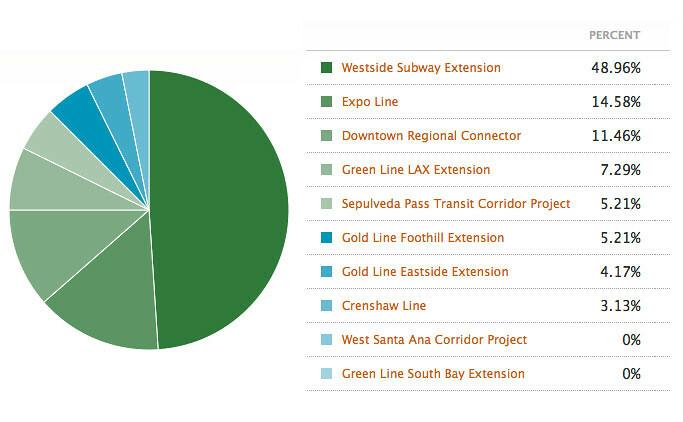 What *potential* future Metro Rail project are you most excited about? The Regional Connector interfaces THREE different lines, touching all faces of the compass, through Downtown. North to Pasadena (and beyond), South to Long Beach, West to Santa Monica, and East to East L.A. (and beyond). THAT is something to get extremely excited about!